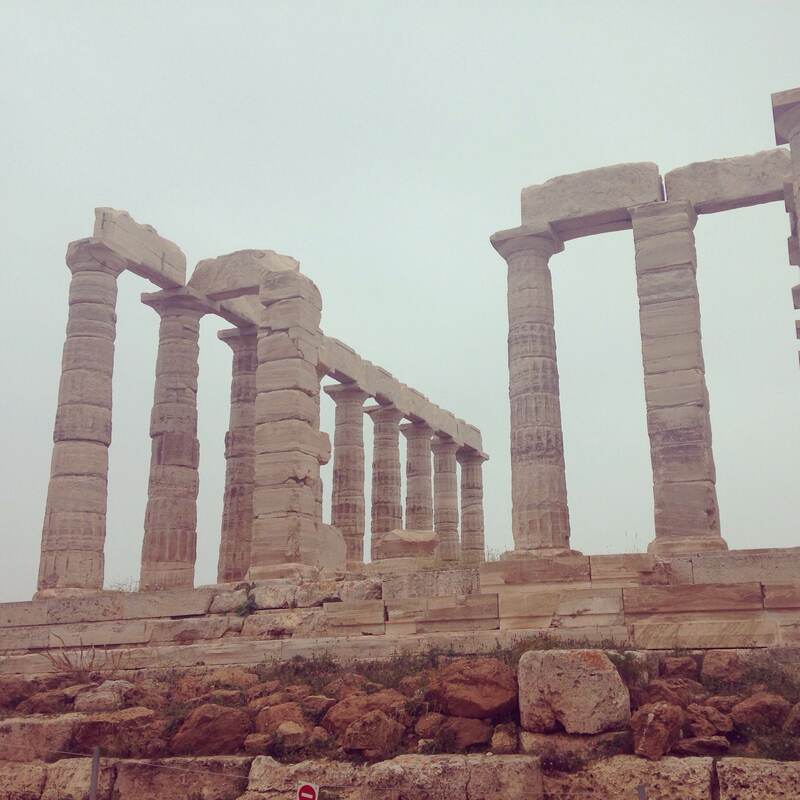 As promised, here’s the second part of my Greek Adventure: Ancient Sites and Ruins Edition. Let me tell you, people, we saw a lot of ruins. You might already know, but Greece is just full of ’em. 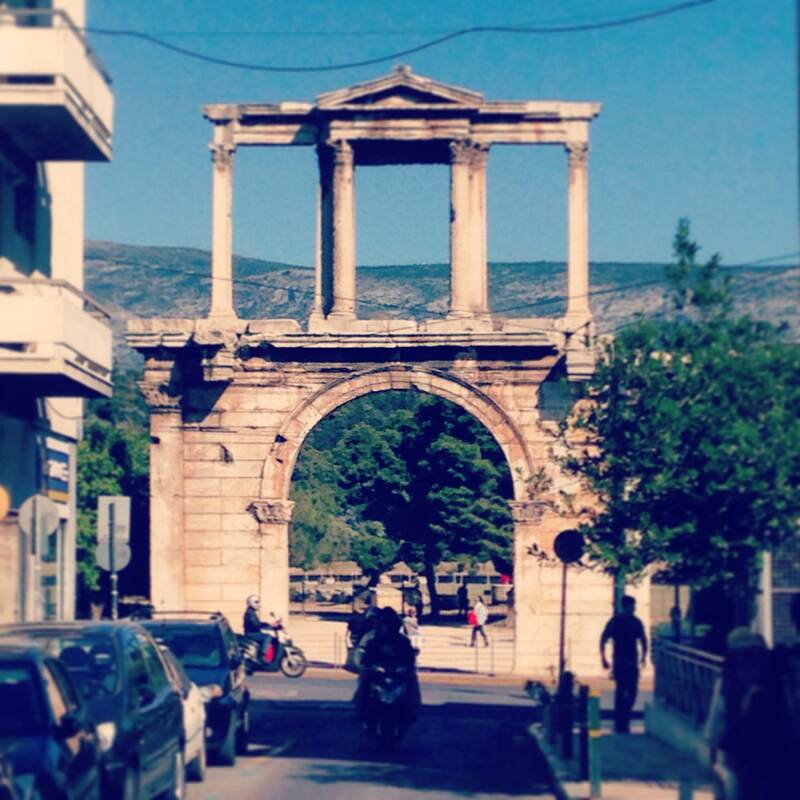 So herewith, a run down of all the ancient places we visited. Obviously, when in Athens, this is the DON’T MISS thing. And it is definitely worth contending with the thousands of other tourists to get a glimpse. 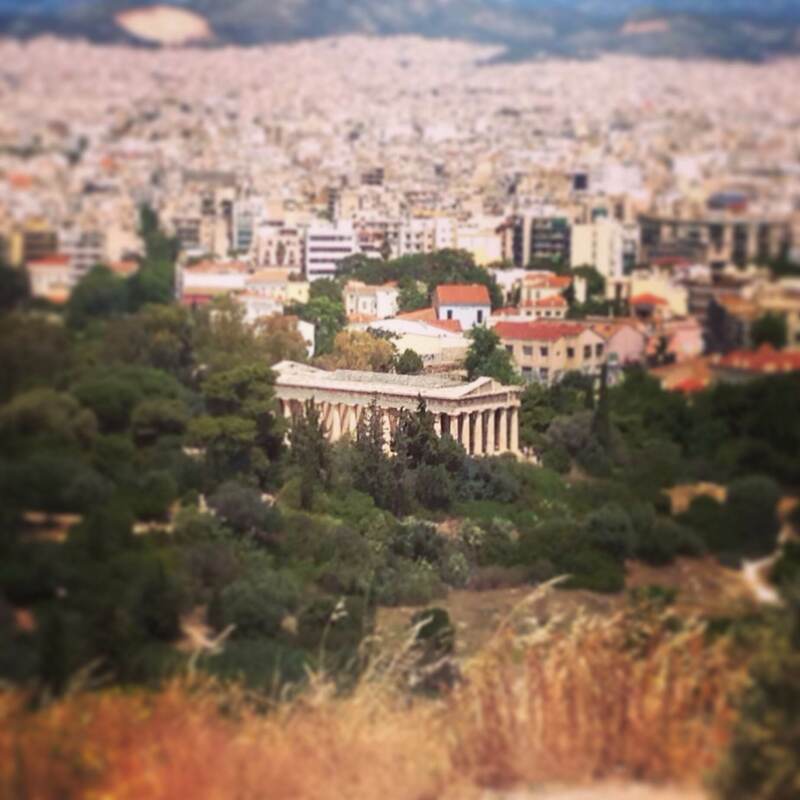 As many of you will know, acropolis means high point of the city (that may not be the strictly literal translation, but that’s what it boils down to). So the Acropolis in Athens is not the buildings on the top of the hill, but the hill itself. There are a load of buildings up there, including the small temple to Nike Athena and the Propylaia (entrance), of which I don’t have decent pictures. Up on the top of the hill, there’s the Erechtheion, which is actually three temples in one, dedicated to Athena and Poseidon. It’s the one with the famous female figures as columns (aka caryatids) on the side. 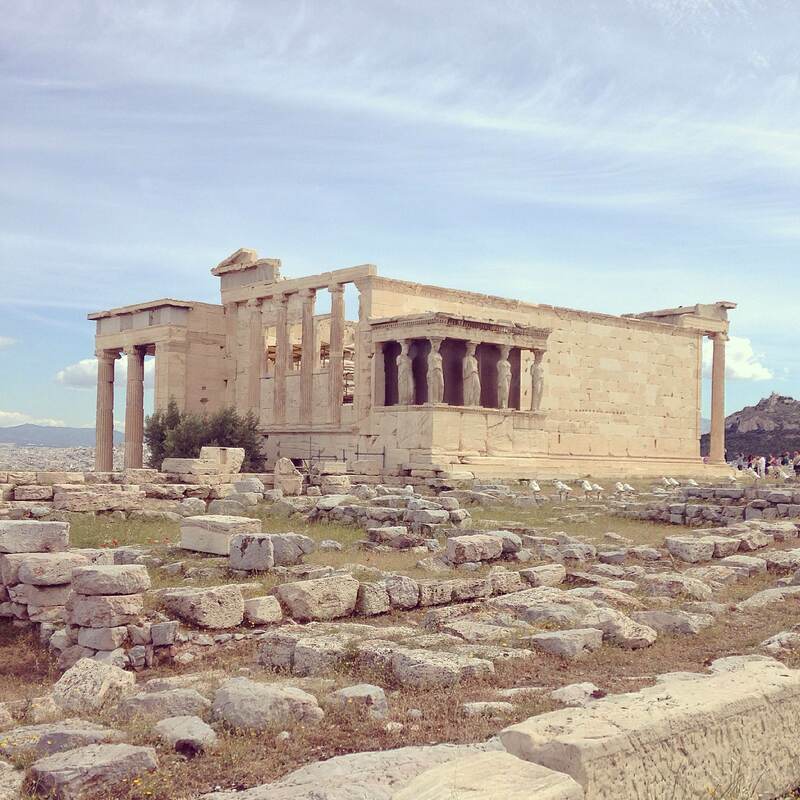 We had a tour of the Acropolis, in which I learned all sorts of interesting things, including the story that Athena and Poseidon competed to be the patron god/goddess of the city. Poseidon struck a rock and brought forth water, but it was salty seawater. Athena provided an olive tree, so the residents of the city chose her as the patron goddess. There’s still an olive tree next to the Erechtheion (visible in the above photo), but don’t be fooled: it’s not the original! 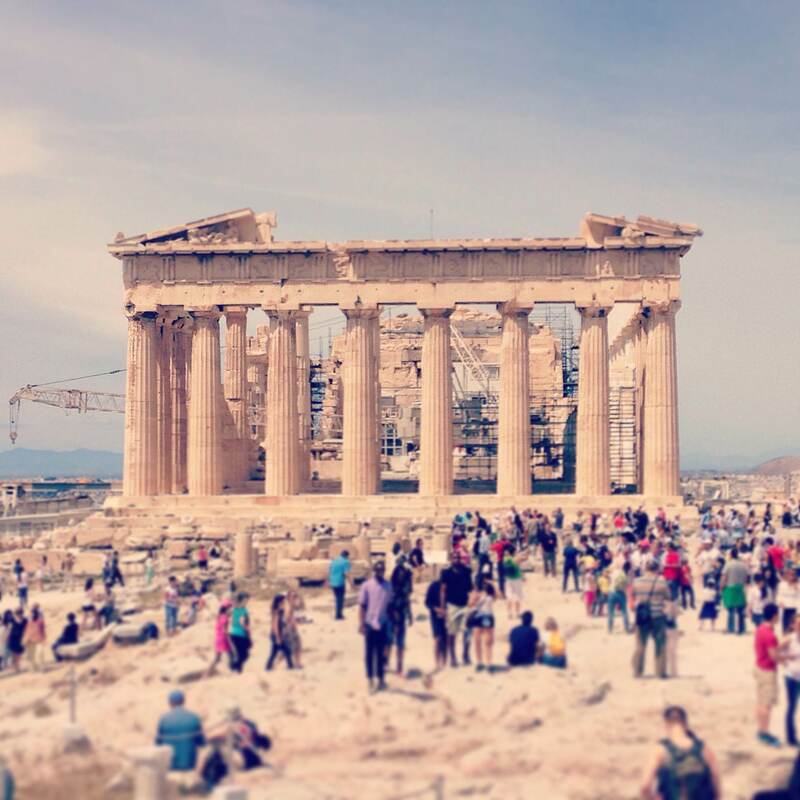 Because Athena was the patron goddess of the city, the BIG temple on the Acropolis was dedicated to her. And that’s the Parthenon, duh. It was pretty impressive. And it was very interesting to see how they are going about restoring it. We went to the new Acropolis Museum another day. 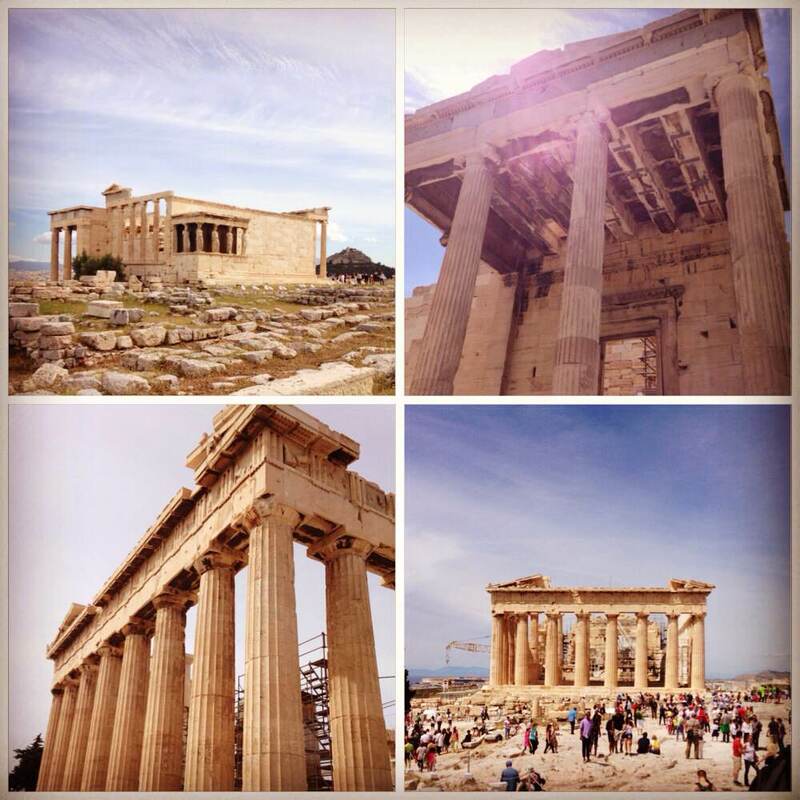 It was opened in 2009 to house all sorts of goodies form the Acropolis, most importantly: the Parthenon marbles. The majority of these are in the British Museum and the battle to have them returned to Greece is ongoing. They’ve done a really nice job of presenting the marbles they do have, alongside plaster casts of the missing ones to give a feel for the scale of the Parthenon in its heyday. There are obviously loads of other ruins dotted around Athens, including the Agora (marketplace), throughout which there are all sorts of ancient bits and pieces, including the remarkably intact Temple of Hephaestus. 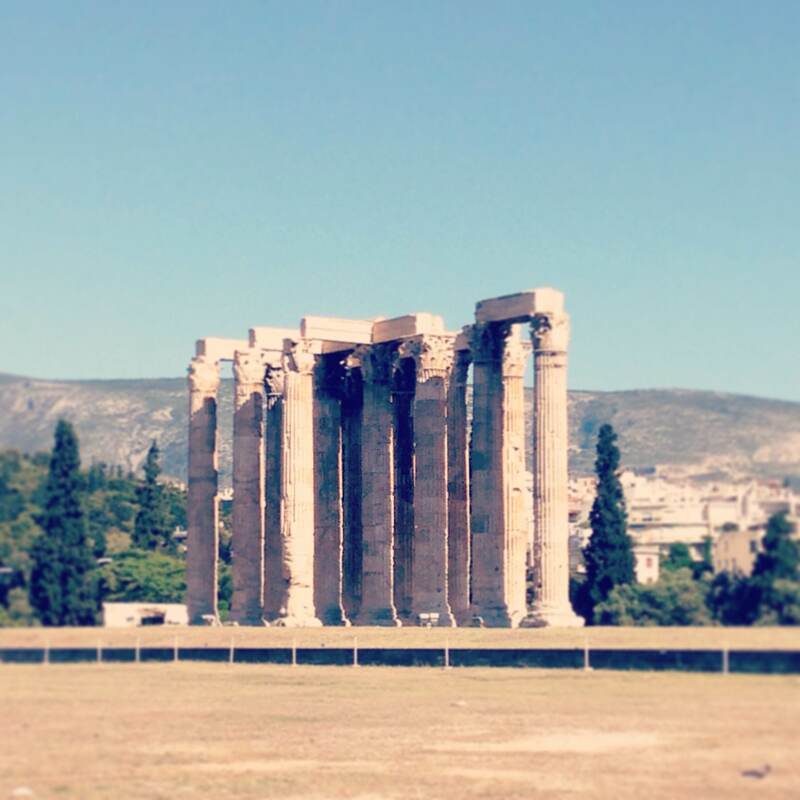 …and the remains of the Temple of Olympian Zeus, which was completed by Emperor Hadrian. Although there are only about 15 or so columns still standing, it was originally made up of 104 (!!!) columns. For context, the Parthenon (which is pretty darn large) had 69. Temple of Poseidon We took an afternoon bus trip out of Athens to visit the Temple of Poseidon at Cape Sounion. This the southern most point on the Attica peninsula. It was cold, rainy and windy that day (our only bad weather day), so our pictures are not great as we were just eager to get back down the hill for a warm drink. You can’t walk into the middle of the temple to see it, but apparently Lord Byron carved his name into one of the columns when he was visiting Greece back in the day. Fun story: This is also supposedly where Theseus’s father Aegeus threw himself off the cliff and plunged to his death when he saw Theseus’s ship returning from Crete (where he’d gone to fight the Minotaur) with black sails, which was meant to be the signal that Theseus was d-e-a-d, dead. But oops! Theseus was just a little spacey and had forgotten to change the sails. He was totes still alive! Anyways, Aegeus’s precipitous leap into the sea is why it’s known at the Aegean Sea today. I thought this was the coolest of the ancient sites we visited, and therefore I have the most pictures of it and the most to say about it. 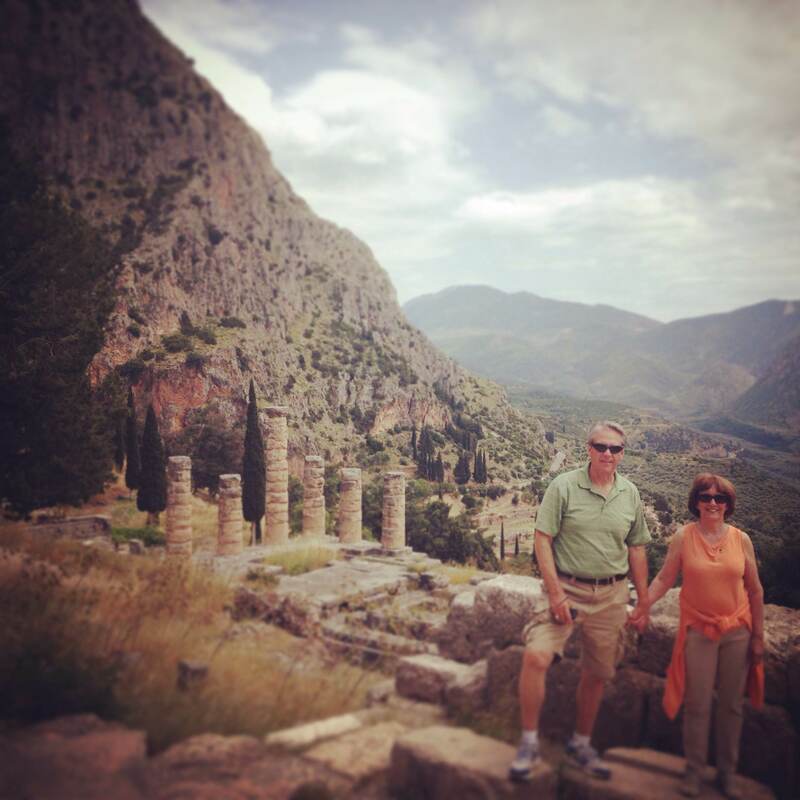 Delphi is a three hour-ish drive north of Athens. The site was built on the slopes of Mount Parnassus. Back in the ancient times, this place was busy busy busy, its big draw being the Temple of Apollo and the oracle who hung out there dishing out prophecies on the regular. The oracle was always an older woman, typically an empty-nester who more-or-less abandoned her husband after her kids were all grown and went to live at the Temple, where she spent her days sitting in a giant three-legged pot (a tripod), chewing on laurel leaves and breathing in vapors from the hot springs. Basically, it seems, she was high all day long – from the laurel leaves or from the fumes or both. People of all types would travel great distances to come and consult the oracle over big decisions – “Should I get married?” “Should we go to war?” etc. She would spout a high-as-a-kite, most likely nonsensical answer and her priests would then “interpret” her words into a more coherent response. Bada bing, bada boom. There’s not a whole lot left of the actual temple. The outline of the base is still roughly visible, and a few partial columns remain. The columns to the left behind Rocket and Melanie are the remains of the Temple. What was more interesting to see and learn about were all the ruins and partial buildings surrounding the temple. Given that the oracle was such a huge draw, a town of sorts sprang up around the temple. Pilgrims entered the temple complex along the Sacred Way. This switchback path led up towards the temple courtyard and altar. Lining the way were market shops, statues and buildings known as treasuries. These treasuries were usually dedicated by a town or city. 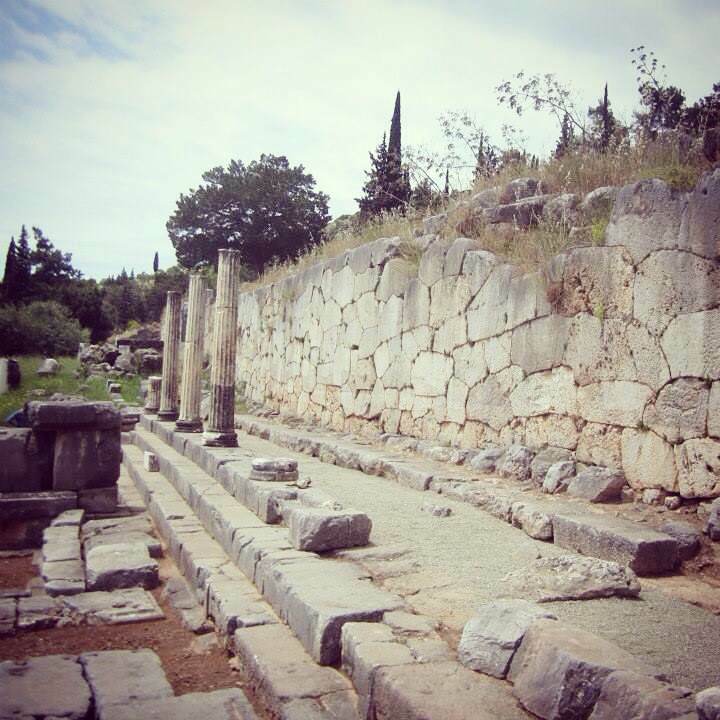 Offerings or presents were stored here by the citizens of those towns/cities as thank yous for the oracle and Apollo. The many statues that lined the way served the same purpose. Apparently, back in the day, the place was chockablock with thousands of statues. Beyond the temple, further up the mountain slope were additional structures, including an impressive amphitheatre. This view down over the theatre gives you a better idea of the scale of the place. You can see the rough remains/size of the temple and imagine what it would have looked like with all its columns and a roof. To the right, you can see the reconstructed Treasury of the Athenians (pictured above). To the left beyond the temple columns, you can see another open, non-shrubby/grassy area. 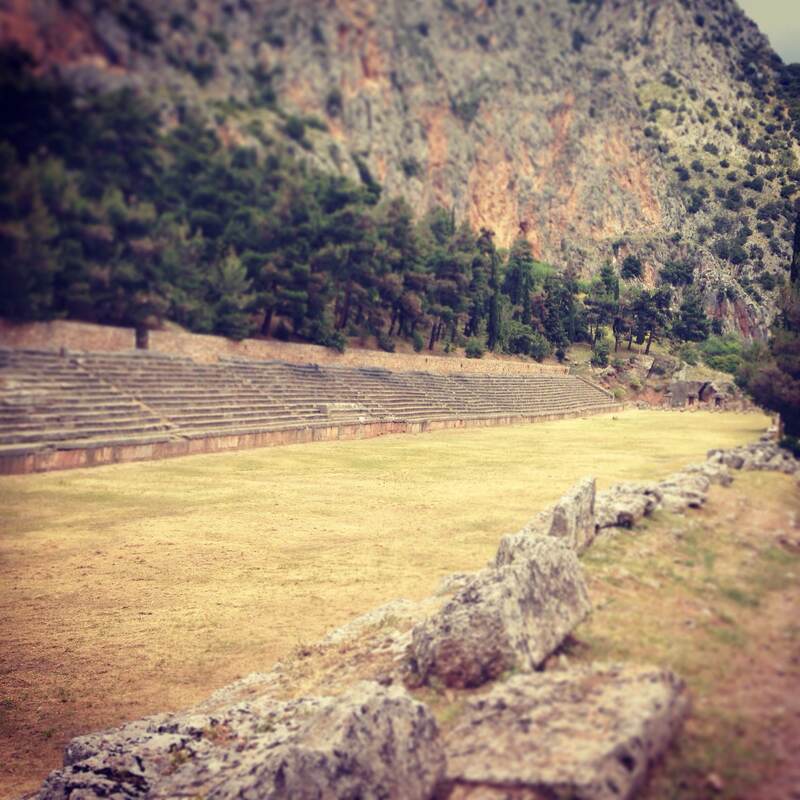 Although you can’t make it out in the picture above, those are the ruins of the gymnasium or training grounds for the athletes who competed in the Pythian Games, which were similar to the ancient Olympic Games (but obviously not held at Olympia and therefore not the same). Continuing up the switchback path, higher up beyond the theatre, you come to the stadium, which is where the athletes actually competed. It was a bit of a hike, but really interesting once we got up there, as it’s very well preserved. Rather than a circular or oval track as we have today, the track was a straight line that they ran back and forth on for the requisite length. You could still make out the stone starting lines with holes into which the athletes would fit their wooden starting blocks. And in the middle of the spectator seats, a special row of judges chairs is still perfectly clear (you can just make them out in the picture above). 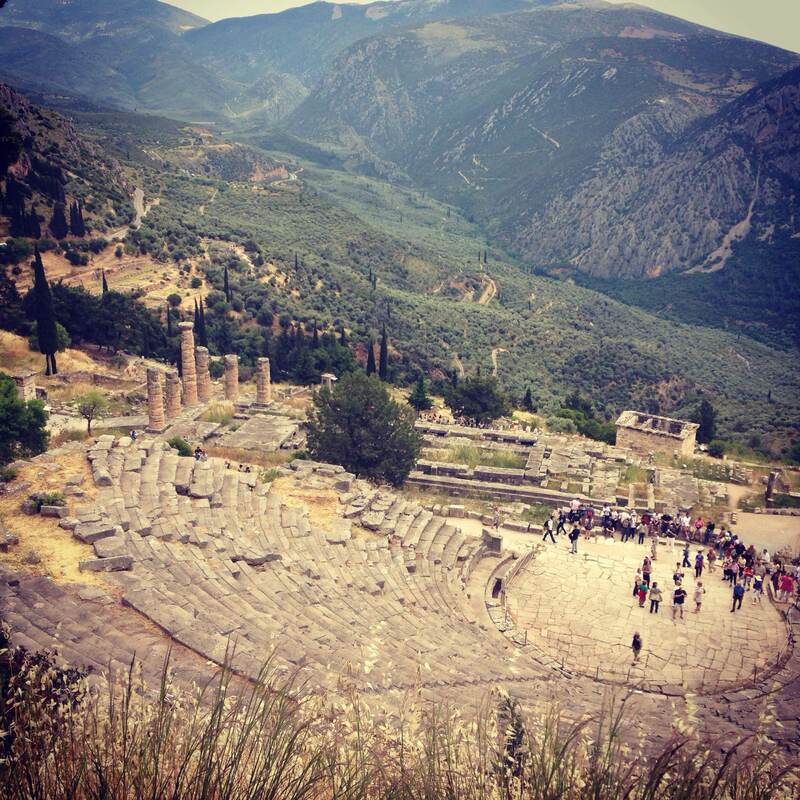 There’s so much more I could say about Delphi. I haven’t told you anything about the museum that is just next to the site and houses many of the statues and treasures the archaeologists uncovered, some of which are extremely well-preserved. And I haven’t mentioned anything about the actual excavation, which involved moving an entire modern town that had been built on top of the ancient ruins, even using some of the old stones. I could go on and on, but there’s not enough space. So I’ll just say: you should go check it out for yourself. The island had a very long history involving various different iterations. Sometimes it was inhabited; sometimes it was forbidden for anyone to live there; at one point the sacredness of the island was paramount; at another point, it was a political gathering place; for a time it was a major trading port. Anyways, all those changes mean that there are all sorts of different ruins/buildings on the island – houses, temples, cisterns, theatres, statues, mosaics – but very few of them are as well preserved as anything at Delphi, for example. 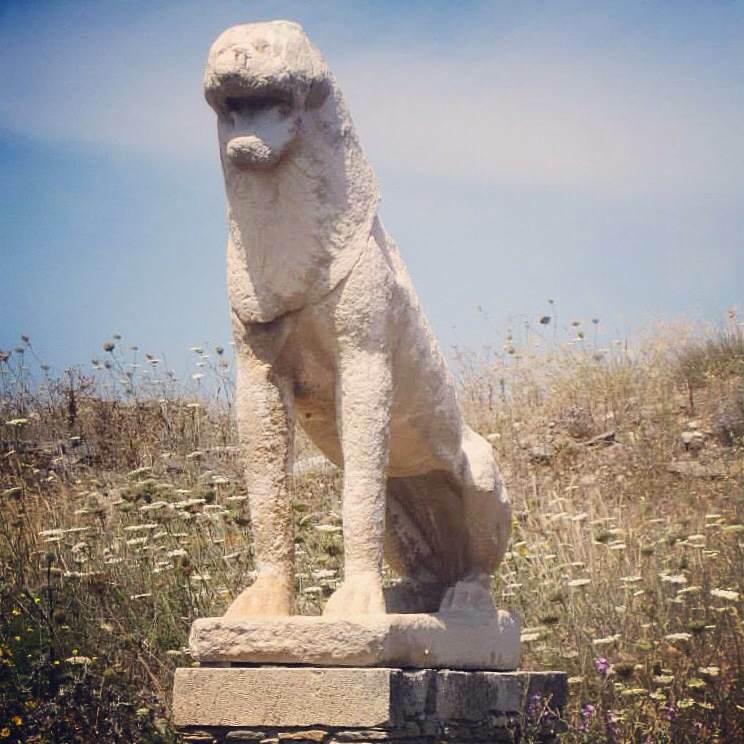 The most famous ruins from the site are the Naxos Lions, a row of crouching lion statues dedicated to Apollo by the people of Naxos. Originally, there were nine to twelve lions; now only seven remain. They’re pretty weather-beaten these days, and in fact, the originals have been moved indoors to protect them from further erosion, but there are replicas in their place. I don’t have any other helpful/useful pictures from Delos, because the ruins are – for the most part – more ruined than intact. The pictures I took from the highest point on the island don’t really look like much of anything other than a jumble of stones. 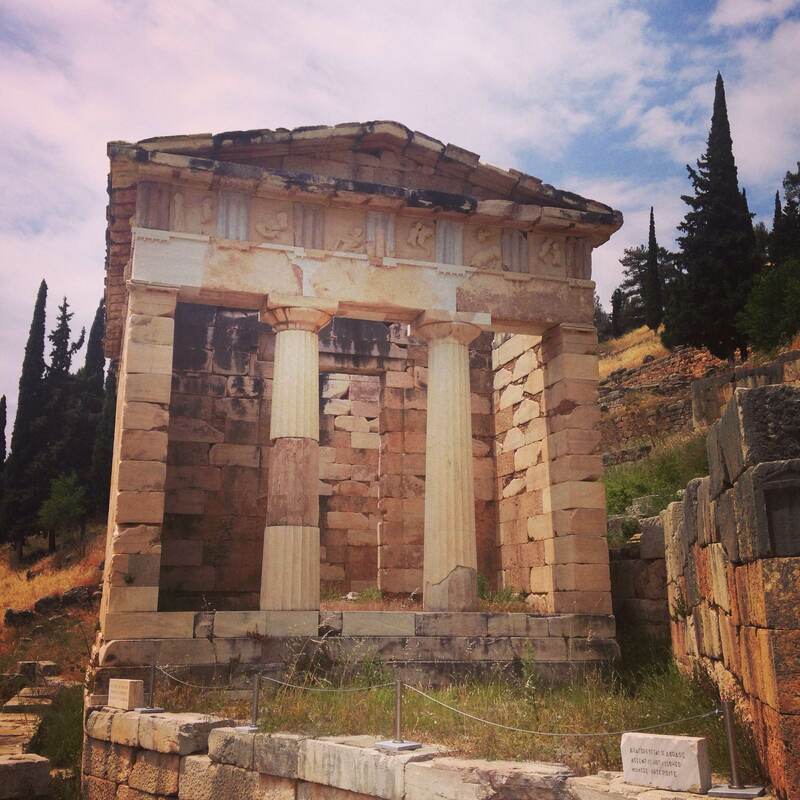 It was interesting to think of the island as a once buzzing hive of activity – be it commerce, religious rituals, political meetings – but unlike Delphi it was harder to really picture it. Our final ancient site was on our short visit to Santorini. Unlike all the previous spots, this was actually a prehistoric site, so like really really really really old. This bronze age site was destroyed in the 17th century BC volcanic eruption that resulted in the island’s current geographical configuration. The settlement was buried in volcanic ash, much like Pompeii. Unlike Pompeii, no human remains have been found, so it seems the residents had warning of the impending eruption (probably an earthquake) and therefore had time to evacuate. Of course, it’s entirely possible that they were then subsequently drowned in the ensuing tsunami, but let’s imagine they all made it to safety somewhere! Aaaaaaaaanyways, the city being buried in volcanic ash means that it is amazingly well preserved. 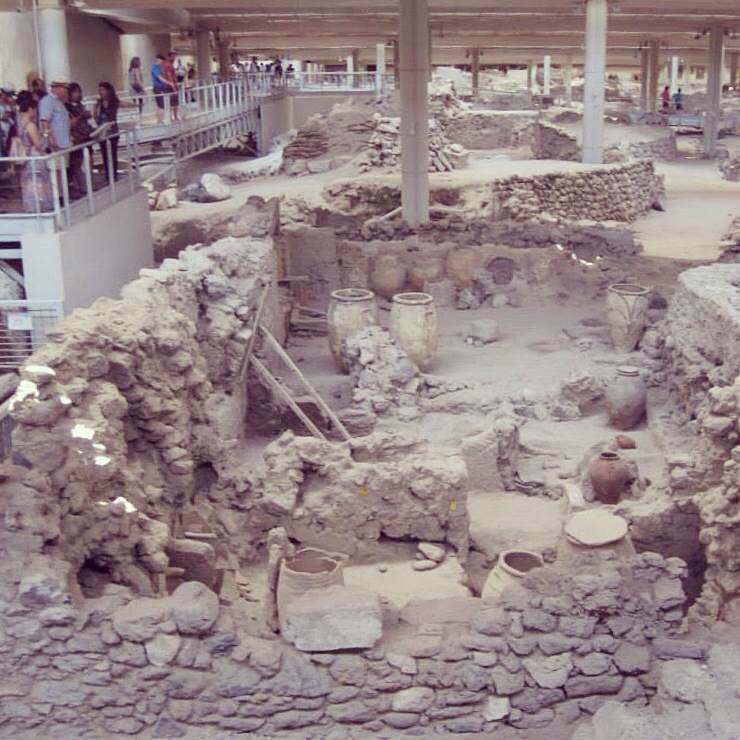 Although original excavations were done as early as the 1860’s, the modern excavations were begun in 1969 by a Greek archaeologist named Spyridon Marinatos. Although he later tragically died while working in the site, his careful excavations and dedication to the project led to the most significant discoveries and it’s current state. The pots in this building indicate that it was probably a shop of some sort. Turns out this civilization was remarkably advanced. Archaeologists have uncovered beautiful wall paintings and mosaics, three story structures, civic and religious buildings, residences, shops, and – most impressively – an intricate plumbing system. The site is covered by a special bio roof that regulates the temperature and protects the ruins. The excavations have actually been halted over funding issues, and only a minimal estimated percentage of the site has been uncovered. If the work ever gets started up again, they could find all sorts of amazing things! And that’s it folks! Those are all the ancient places we visited. Quite impressive to see all these structures and think about all the people who lived there thousands of years ago. 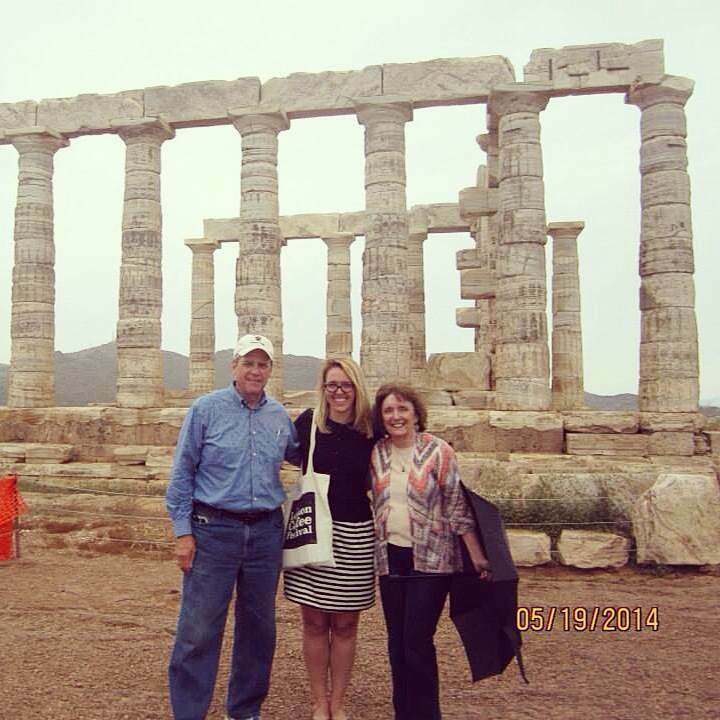 If you’re into history, go to Greece! There’s so much to see and learn!